As we head into the weekend, I thought I’d share one of my favorite summer drinks: lemonade, but with a twist. For many of us, we only have a few short weeks before fall arrives and pumpkin spices start to lure themselves into many of our drinks. So while you can, spruce up your lemonade with herb-infused simple syrup, seasonal fruit or flowers for a very nice, fragrant and particularly refreshing drink. 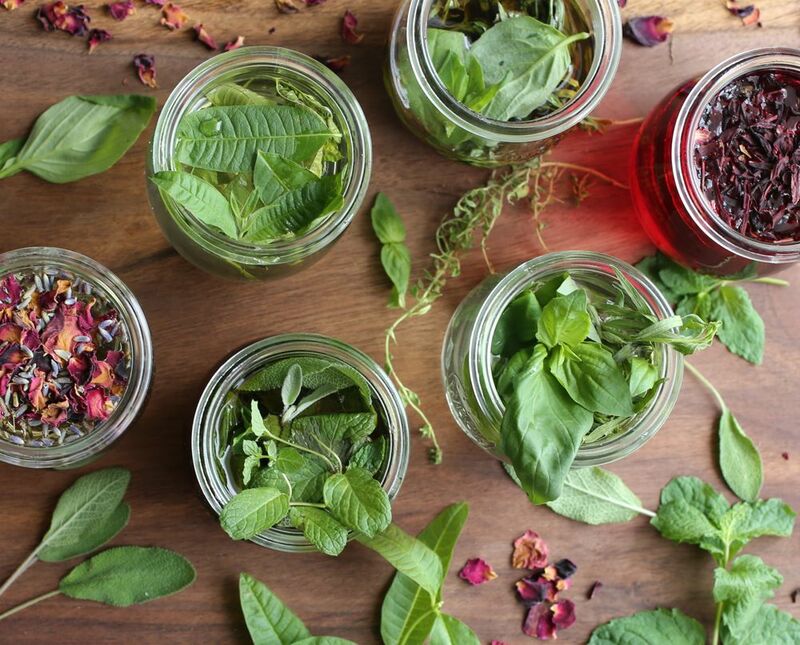 With distinctive combinations like sage and mint (a favorite of mine), basil and tarragon, blackberry and mint (or thyme), lavender and rose, strawberry and basil (another favorite), lemon verbena, and currant and rosewater, lemonade—the quintessential summer drink—gets even more interesting and flavorful. The subtle herbal, fruity and/or floral notes are so cozy and warm, yet also cool and refreshing, if that makes any sense. Putting it all together is quite easy. You just have to steep some fresh herbs or food grade/edible flowers (I’ve used rose, lavender and hibiscus) in simple syrup and then add fresh lemon juice, fruit (if using) and ice. I like to use several containers to infuse a variety of different flavor combinations at a time. Sometimes my kitchen ends up looking like a science lab with all my infusions, but I find it’s very convenient and practical to have already infused syrups as well as freshly squeezed lemon juice (in a separate container) on hand to quickly mix up flavored lemonades when necessary. 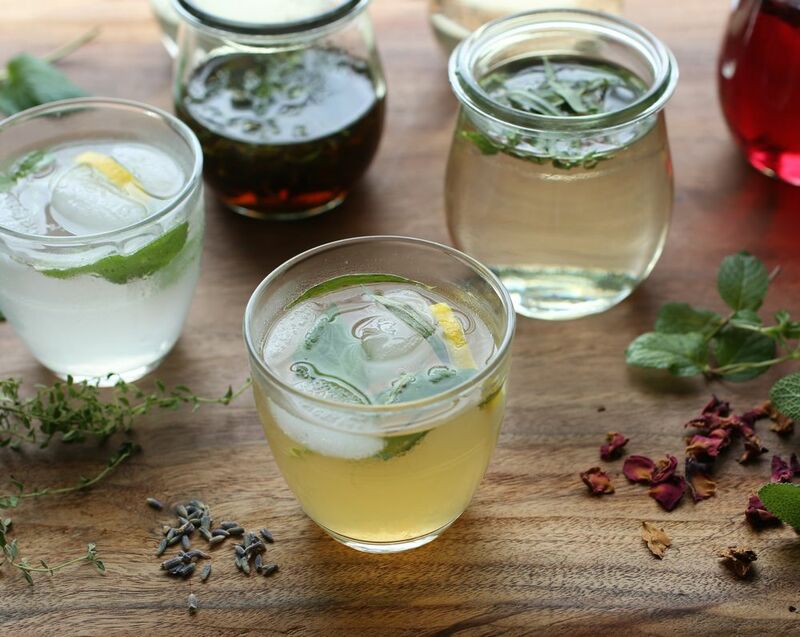 If you haven’t yet tried “doctoring” your lemonade with herbs, please do. It’s nothing short of delightful. Almost any of your favorite herbs will do and you can also combine them with your favorite floral notes or summer fruit—peach and thyme, watermelon and thyme, strawberry and hibiscus, rosemary and…you see where I’m going…, the possibilities are endless. Let me know if you have any of your own favorite flavor combinations. To make simple syrup, bring sugar and water to boil. Simmer and stir until all sugar is dissolved. Remove from heat and allow herb(s) and/or flowers to steep for at least 30 minutes to an hour and allow to cool to room temperature. If you won’t be using it immediately, cover in an airtight container/jar and refrigerate until ready to use. 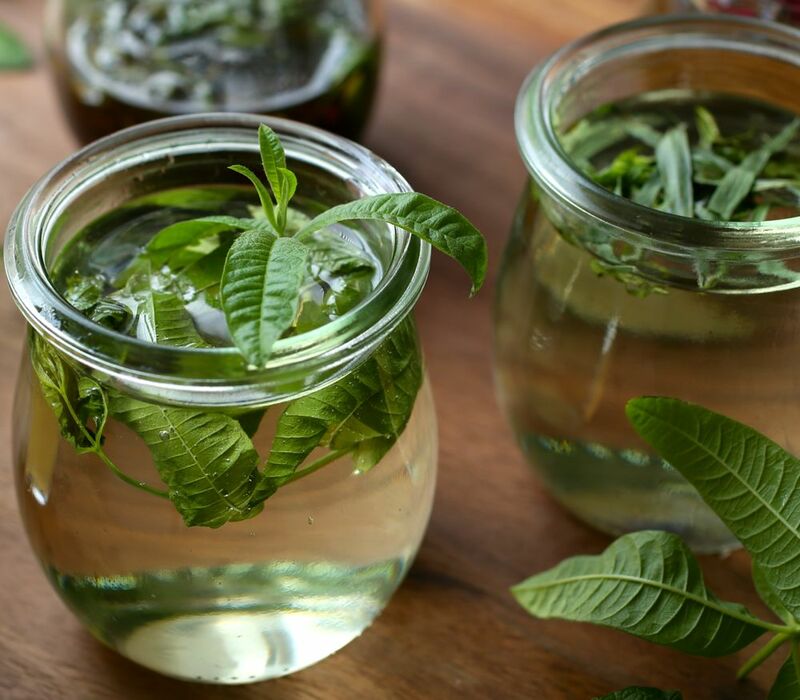 Remove infused leaves from simple syrup and combine cooled syrup (if you’re only making a small pitcher of lemonade you likely will not need to use all of the syrup) with lemon juice and water. In a large pitcher, start with about 1/2 cup simple syrup, 1 cup lemon juice and 3 cups water. Then adjust sweetness and tartness to your taste preference by adding more syrup, lemon juice or water. Note that when you add ice it will dilute your drink. Serve over ice and garnish with herbs and lemon slices, if desired. Note: To add fruits, you can either steep whole berries or fruit pieces in simple syrup then add to lemonade; or purée fruit, strain and add to lemonade; and/or simply add fresh pieces of fruit to your lemonade. For example, strawberry-basil lemonade can be made a few different ways. In the past I’ve always made my lemonade then added fresh strawberries and basil leaves to my pitcher. Now, however, I prefer to infuse the basil leaves in the simple syrup and then add fresh strawberries to the pitcher. Another way could be to infuse the syrup with basil and strawberries, then add the simple syrup and strawberries to the lemonade. At this point I’d discard the basil leaves that were infused and add fresh leaves to the pitcher. 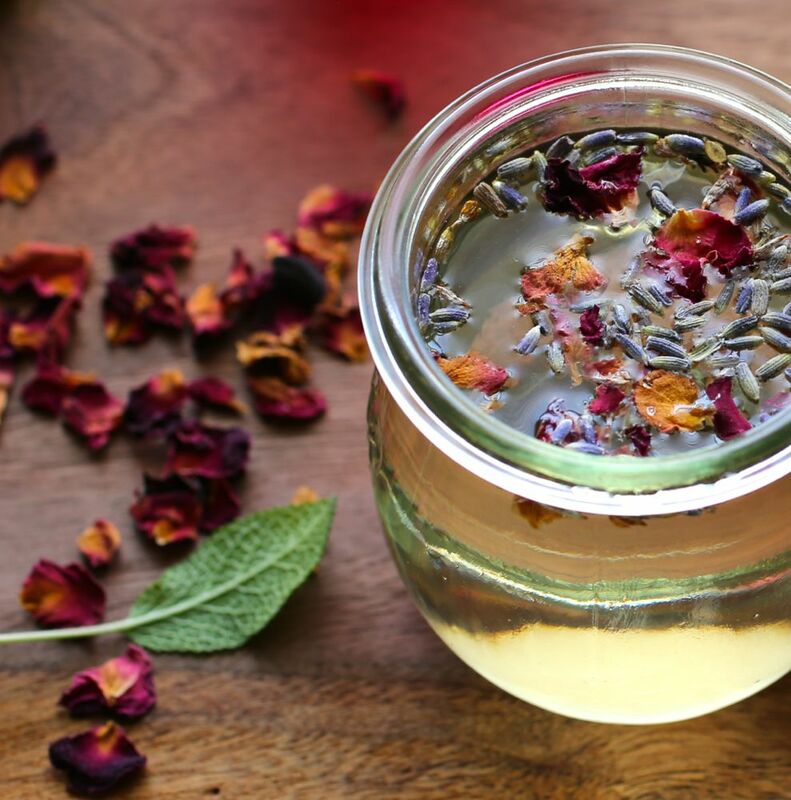 To make Lavender and Rose lemonade, I infused a teaspoon lavender with a teaspoon of food grade rose petals into simple syrup. For hibiscus lemonade, infuse 1-2 teaspoons hibiscus petals into simple syrup. Try also making infused lemonades with sparkling water, if you like. These look so beautiful and delicious. I might try out rose and ginger! Hi Aliya, thank you! Rose and ginger sounds like a fabulous combination!